The Cuisinart CGS-333 is a 3 piece professional tool set that turns any griller into a pro, with quality tools that look as good as the food will taste. Made of durable stainless steel, the ergonomic rubber grips keep in control at a safe distance to spear, flip, and grip food as it grills. This set includes a grill spatula, silicone tipped grill tongs, and a grill fork. 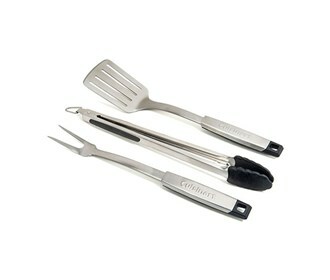 The Cuisinart 3-Piece Professional Grill Tool Set has many exciting features for users of all types. 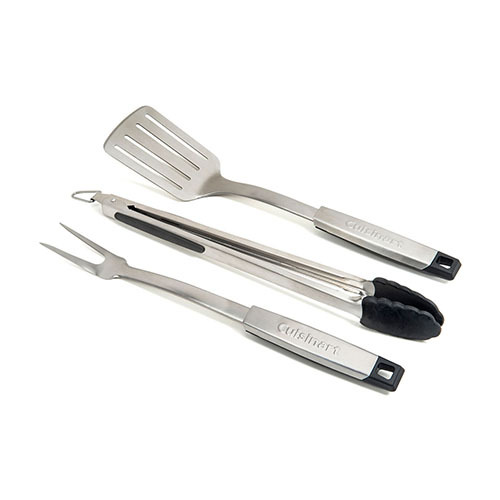 You can extend the lifetime of your Cuisinart 3-Piece Professional Grill Tool Set with the purchase of a FactoryOutletStore Factory Protection Plan. The Cuisinart 3-Piece Professional Grill Tool Set is sold as a Brand New Unopened Item.